For the Cause, Risks and Rewards, a short story just released on Kindle, is an excerpt from the novel For the Cause; The Cold War Turns Hot in Korea and Why Young Men Went to War. The excerpt consist of Chapter 21 of the novel with minor changes. The complete short story is posted here. All rights reserved. No part of this story may be used or reproduced by any means, graphic, electronic, or mechanical, including photocopying, recording, taping or by any information storage retrieval system without the written permission of the publisher except in the case of brief quotations embodied in critical articles and reviews. 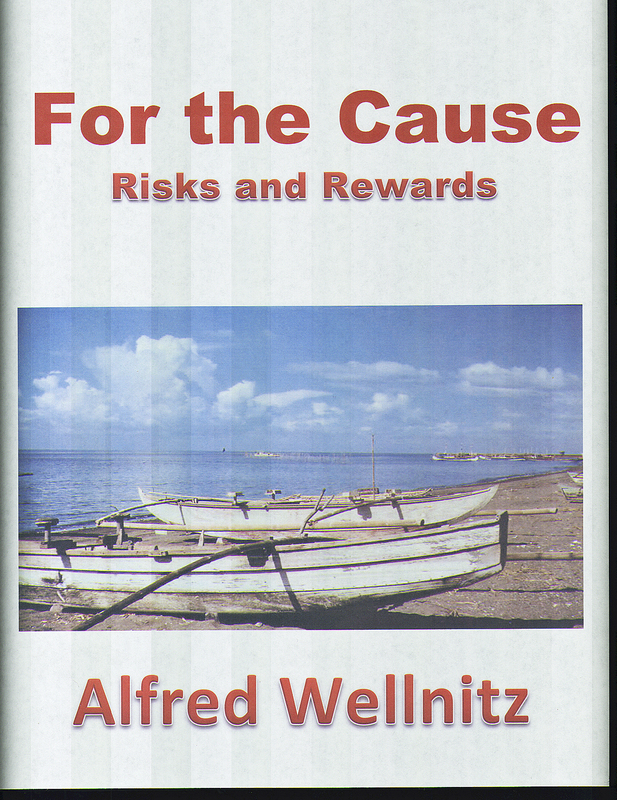 Alfred Wellnitz grew up in rural South Dakota, served in the United States Navy and worked in technology as an electrical engineer. After retiring from engineering he worked as a real estate agent before deciding to become an author at age seventy-three. He has since published three novels and numerous short stories. Alfred now lives with his wife Joan in Bloomington Minnesota. In a small fishing village on the shores of Manila Bay in the Philippines, halfway between Manila and Cavite, a young man named Modesto tossed and turned in his blanket on the floor of a Nipa hut. Beside him the frequent stirring of his wife betrayed her restlessness. Only their child in the near corner slept soundly. Finally Modesto threw his blanket aside, picked his way to the doorway and let his bare feet drop to the sand still warm from the day’s sun. From where he stood he could see a large portion of Manila Bay. To his right and behind him the bright lights of Manila made the sky luminous, before him the bay lay dark except for the dim lights of fishing boats that flickered and bobbed. Over to the left a cluster of lights marked Cavite and the United States Naval Air Station at Sangley Point. The lights of Cavite also backlit an array of ship superstructures protruding out of the water, the hulks of Japanese ships laying where they were sunk during the big war that ended five years ago.Modesto, small in stature, lean and muscular, had been a fisherman since he was old enough to pull nets and row a bonga boat. His jet black hair and bright brown eyes were complemented by chocolate-colored skin which still had the smoothness of youth. Tonight being Christmas Eve, he and Carlos and Chico were not fishing. Other than Christmas and Easter or during bad storms, they would normally be out in the bay fishing at this time of night. Their families depended on them to catch fish nearly every night. No fish meant there would be nothing to barter for rice, no pesos, no centavos, and no fresh fish for the fishermen’s families to eat. Modesto was a good fisherman. There were very few days when there was no fish or rice to cook in his hut. There usually were enough pesos for at least the necessities and even for some extras, like during the fiesta and at Christmas and Easter. However, the three fishermen would be taking the bonga boat out onto Manila Bay this Christmas Eve, not to fish but on a special and unusual mission. Modesto left the hut and moved aimlessly along the beach. He recalled the events of the last three days that led to what he would be doing tonight. Modesto and his two companions had been returning from an unsuccessful night of fishing in their bonga, a boat barely large enough for the three-man crew, their nets, and sometimes a good catch of fish. They were tired, wet, and aching from their night’s labor. Intermittent rain, sometimes heavy, had combined with abnormally low temperatures to make it a bitter night. For their efforts and misery a reward of only a half-dozen lapa-lapas lay on the bottom of the boat. They paddled towards shore in weary silence. As they rowed, they could make out the outlines of the hotels and casinos along Manila’s Dewey Boulevard. The crew sat in a row from front to back in the narrow boat. Chico, the youngest, held down the middle position. He looked small even huddled under a bulky poncho. Chico, the son of Carlos the oldest member of the three men, had only recently joined the crew. Chico had been a hut boy for marines at Sangley Point; a good paying job. For reasons unknown to Modesto, Chico no longer worked at Sangley Point and Carlos had added Chico to the crew. Chico stopped paddling and broke the silence. Modesto listened in silence. There were times that he had felt the way Chico did, and still did, but he had a wife and child and he had to provide for them in the only way he knew how. Someday in the hereafter he would be on the same level as the good rich and above that of the not-so-good rich. Easier for a camel to pass through the eye of a needle than for rich men to get into heaven. That’s what the good fathers say. Such thoughts made life a little more bearable at times. Later that day, Modesto and Carlos were repairing one of the bonga boat’s outriggers. Carlos owned the boat and therefore, when the catch was successful, received an extra share of fish. Carlos had inherited the bonga, his most valuable possession, from his father. Frequent repairs kept it usable. Two strangers accompanied Chico. One, a gaunt, small-framed young man, was unremarkable except for deep-set eyes which glowered under heavy, dark brows. His dress, typical for men his age in the village consisted of loose-fitting grey pants, an un-tucked white shirt, and sandals. He could have been a Jeepney driver or a street vendor. The other man dressed in a similar way but was taller, heavier, and had a round face with Asian eyes. The two men surveyed the boat. The one named Wan walked around it and kicked the outrigger Modesto and Carlos had been working on. Modesto wondered what they were talking about. What did it matter if the boat was small or could haul a lot of weight? It worked for what they used it for. The two strangers and Chico moved some distance away and talked among themselves. After a short time they came back to where Carlos and Modesto had started working on the outrigger again. “Pepe and Wan would like to talk about a business deal,” Chico announced. Pepe again hesitated, allowing time for this information to be fully absorbed. Modesto felt a tightening of his stomach. Beads of sweat were forming on Modesto’s forehead. He thought, this man is loco, but he held his tongue and waited for Carlos to speak. Skeptical or wary, Pepe knew he had the fisherman’s attention. “You will be surprised at how lightly guarded the armory is.” Pepe picked up a stick from the beach and drew a sketch in the sand of the peninsula that projected into Manila Bay, much of which was occupied by the Sangley Naval Air Station. Pepe added detail at the very tip of the peninsula to show the location of the Quonset hut being used as an armory. The fishermen were familiar with the navy base as seen from the bay and were able to easily follow Pepe’s description. They were also familiar with the searchlight and saw it sweep around the base’s periphery many times when they fished at night. It didn’t matter to Modesto if Pepe and Wan were Huks or not. He didn’t want any part of this crazy idea but he could see that Carlos was seriously considering Pepe’s proposition. Of course they had to be Hukbalahaps, the Huks, the Philippine communists. That was the only answer that made any sense to Modesto. They were the only ones that would have the need for that much ammunition and the means to pay that kind of money for it. Modesto didn’t know exactly what the Huks were trying to do, but he knew there was serious trouble between the Huks and the government in Manila. The Huks had been around for a long time. During the war they had fought the Japanese and were big heroes. Now they were fighting the government and weren’t heroes anymore. It seemed like they wanted to fight whoever happened to be in power. Modesto didn’t know if they were good or bad. Pepe looked like an ordinary Filipino, not like a revolutionary or communist, whatever they looked like. Not that it mattered much to Modesto. Modesto considered himself a pretty good Catholic, while Carlos and Chico weren’t and they would admit it and that’s their business. If a person wanted to be a Huk, that’s their business. A thousand pesos! That was more money than Modesto had ever seen at one time. Carlos had fished Manila Bay for a living since he was able to do it. He had no hopes or plans to do anything else and he had no hope of ever having more than a bare living as a fisherman. When Carlos became too old to fish he hoped he would sit in the Nipa hut of his son Chico until the day that they carried him out to the cemetery to lie beside the father that he had cared for so many years before. It was not a great deal to anticipate but realistic and predictable. The wild scheme they were considering now was something else. After Pepe and Wan left, the three fishermen discussed the proposition that had been presented to them. Carlos had done the talking when Pepe made his proposal, now he wanted to know what Modesto thought of the idea. Modesto had known Carlos since he was able to remember. Carlos’s life provided a model for Modesto’s life. Modesto respected Carlos’s judgment in most matters but had been surprised when Carlos seemed to be considering going forward with a raid on the armory on Sangley Point. Manila Bay fishermen considered Sangley Point off limits. Even fishing near it was questionable. To land on its beach and raid an armory seemed totally loco. “It sounds crazy and dangerous,” Modesto said in response to Carlos’s question. It was a little before midnight when they arrived at a position where they could observe the armory and the marine guard while they fished. Lights in the nearby enlisted men’s hut area made the armory and guard path dimly visible. At midnight they noted the changing of the guard and observed the marine on duty as he made his rounds. The marine moved back and forth along the beach between the guard house and some point along the west side of the peninsula. As Pepe had said, it took the guard about fifteen minutes to walk from one end of the route to the other. They had moderate success fishing and after a couple of hours had a sack half-filled with lapa-lapas. At two a.m. Carlos suggested that they go onto the beach near the armory and check out the door lock. “What! Why?” asked a surprised Modesto. They decided that both Modesto and Chico would go to the armory to check the lock while Carlos stayed with the boat. While they contemplated making the landing, they realized they would need to time their movements carefully. They wanted to go onto the beach once the guard passed the armory and was heading away from it at the same time the light on the tower had gone dark. This combination did not come up regularly. The first time they considered going in, the tower light had gone out but they weren’t sure when the guard, who was out of sight on the west side of the peninsula, would reappear. The next time the light swept the beach, they could see that the guard was moving towards the armory from the east. They were concerned the light might come on again before he would be clear of the armory area on his way to the other side of the peninsula. Finally, the light finished a sweep just as the guard was seen going towards the west end of his route. They pushed towards shore and were soon scraping the bottom of the boat on the sand. Modesto and Chico jumped out of the boat and ran towards the armory. It took only a few minutes for the two fishermen to run to the armory and determine that a padlock secured the armory door and pry bar could be used to break the lock. They ran back to the boat and rowed away from the shore towards relative safety. The three stayed in their fishing location until the rising sun allowed them to observe the beach in more detail. It appeared that the path the guard walked was obscured from easy observation on the land side by the embankment that ran along the full length of the route. Their attention was drawn to two large tree trunks with roots attached washed up on the beach about a hundred meters to the west of the Quonset armory. Carlos suggested it would be a good place to hide while they waited for the right time to overpower the guard. They moved the bonga boat closer to shore and could see that the attached roots held the lower parts of the trunks off the ground far enough for a person to crawl beneath them. They all agreed that it looked like an ideal place to hide while waiting to overpower the guard. Later that morning they returned to their home beach, tired from a full night of fishing and information gathering. They would get together that afternoon after they had rested to discuss the matter and make a decision. Modesto tried to get some rest, but his mind continued to wrestle with the proposed raid. His first reaction had been to oppose the idea, even to the point of defecting from the crew if Carlos and Chico wanted to do it. But as he became more familiar with what the raid would involve, his mind grew more at ease. A big factor in his thinking had been their ability to get on and off the beach undetected the previous night. He contemplated the prize that would be theirs if they were successful. They could buy a large power bonga and have pesos to spare. They would be able to fish outside the bay and better their chances of success. When Modesto finally drifted off to sleep, the contemplated prize loomed larger and the risk seemed to be diminishing. When the three fishermen met the next afternoon, Carlos again asked Modesto and Chico for their opinions. Chico of course wanted to go. Modesto had resolved his concerns. The prize seemed too large to pass up. He now supported going forward. Carlos said he also favored proceeding. They started to discuss the details. Anyone observing the three fishermen huddled on the sandy beach would have thought they were mending a net or visiting, certainly not planning a daring raid on a United States military installation. Modesto knew Chico had his own agenda with regards to Americans. That a former girlfriend now shared her place with a marine may have helped form his opinion. His abrupt departure from his Sangley Point job may have aggravated it. They continued planning. Modesto and Chico would be landed on the beach and take cover under the tree trunks. Carlos would move the bonga back out into the bay. When an opportunity presented itself, Modesto and Chico would overpower the guard and break into the Quonset hut armory. They would remove as much ammunition as the bonga could haul and stack it in the shadow of the armory to keep it out of sight of the tower. They would use a flashlight to signal Carlos to bring the boat back to the beach when they were ready to load the ammunition. To Modesto, the plan seemed simple and doable. Later in the day, Pepe and his partner returned and learned that the decision had been made to proceed and the raid would take place that night. Pepe seemed surprised that they were moving so soon, but he had brought a thousand pesos in up-front money and they finalized the arrangements. That night Modesto wandered along the beach, waiting for the time to pass so that he could join his companions and start on an adventure that would (pray to God, hail Mary) make them all rich. A few days ago he wouldn’t have dared hope for anything more than enough food to eat and bare necessities for himself and his family. Now heady dreams filled his mind. He would be part owner of a big power bonga, a big fisherman who went after the big catches outside the bay. He would have a Nipa hut with more than one room and furnished with a bed and a cooking stove. He curled his toes in the sand. He might even buy a pair of shoes. Chico finally showed up, yawning, at the agreed-upon time. Carlos stood up and started pulling on the boat. “Let’s go,” he said, and all hands joined in launching the bonga on its special mission. Each person assumed his position, and soon their rhythmic paddle strokes were moving the boat smoothly through the water, the bow making a luminous splash as it broke the flat surface of the bay. Modesto mechanically dipped his paddle. The closer they came to the base, the more uneasy he felt. Was he a coward? Modesto had never done anything like this before. He had known danger when they had been caught in storms while fishing, but that is a normal part of a fisherman’s life. This would be something different. Carlos started talking about how this raid reminded him of ventures more dangerous and not as carefully planned during the big war. There were other differences. Those raids had been mainly for food because he and his family were starving. Sometimes he had picked up other things, too, but food had been the main thing. This raid was for money, enough money to change their lives. Another difference had been that he disliked the Japanese. He didn’t particularly dislike the Americans. Americans were overbearing, over-paid, oversexed, and drank too much, but Carlos believed that overall, their intentions were good. Modesto wanted to know if Carlos would feel guilty about stealing from the Americans. Modesto had thought about the same thing. Was this really stealing, would he be breaking any of God’s laws? He concluded that some of the laws of men might be challenged, but not God’s laws. The commandments as interpreted by Modesto pertained to individuals, to neighbors. Who did that ammunition really belong to? Maybe Filipinos had as much right to it as Americans. Maybe he would be. His mind would be fully occupied and he would not have time for imagined dangers. The thoughts of wealth and a new life he had had earlier in the evening were now crowded out by more urgent thoughts about the danger and what might go wrong. Sangley looked bigger and brighter than usual. They rowed the bonga onto the beach. Modesto crossed himself, and he and Chico jumped out of the boat and found shelter under the large tree trunks. They carried iron pipes, machetes, and what they would need to bind and gag the guard. Modesto knew that the marine would be armed with something better than an iron pipe. Successfully overpowering the guard had always been a concern, and the concern became magnified by the reality of their situation. Between the water and the tree trunks were over five meters of open beach, and the marine could be anywhere in that area when he passed them. What if the searchlight came on while they were overpowering him? While Modesto contemplated these difficulties he heard the guard approaching. He was walking slowly, quietly whistling some tune over and over. In the dim ambient light Modesto could see that his carbine was slung over his shoulder and he had a soft-billed cap on his head. Good, he’s not wearing a helmet, thought Modesto. At that moment, the tower light snapped on and started sweeping the beach. The guard safely passed the tree trunks as he moved towards the armory. Soon after the light went out after its next sweep of the base, the marine guard could be seen coming back from the direction of the armory, still whistling the same tune. He moved steadily towards the tree trunks where Modesto and Chico were crouching. When the marine reached the vicinity of the tree trunks, he paused, stopped whistling, and turned to look at the bright lights of Manila. Modesto and Chico made their move. The marine appeared startled by the noise Modesto and Chico made but before he could react Chico swung his pipe and hit the marine in the back of the head. As the marine fell, Chico swung his pipe at the back of his skull again. “That’s for good measure, Joe!” he hissed. They dragged the limp marine into the shadow of the tree trunks, rolled him on his stomach, and worked feverishly to bind and gag him. Chico put the gag in the guard’s mouth while Modesto pulled his arms behind him and began wrapping the rope around his wrists. Chico disappeared into the darkness while Modesto began to knot the wrist binding. Suddenly, the marine gave a grunt, pulled his wrists loose and rolled over, throwing Modesto off his back. Modesto landed near his machete when he fell to the ground. He grasped the handle with both his hands, raised it over his head, and brought the blade down with all his might on the neck of the struggling marine. The blade cut through flesh and cartilage, stopping only when it hit the vertebrae. Modesto, still grasping the machete, stood up. He started towards the armory and then paused to pick up the carbine the marine had dropped on the beach. Modesto found an upset Chico attempting to break the lock. Modesto took the bar from Chico’s hand, took aim and brought it crashing down on the padlock. The padlock flew off, hitting Modesto in the leg on its way to the ground. They groped their way into the dark armory. Inside, they could feel boxes that must be ammunition cases. They grabbed hold and started stacking the cases in the shadow of the Quonset. They had stacked four boxes when the light came on again. While waiting for the light to go out, Chico asked if the guard was securely tied. “He is secure,” Modesto replied without going into any further detail. The light went out and they finished moving two more boxes, as many as they felt they could haul in the boat, and then waited for the light to go on and off again. When the light went out the next time, they signaled Carlos. He brought the bonga onto the beach near the Quonset, and they started loading the ammunition boxes. Then for some reason, the searchlight that had just gone out a short time before came on again and swept along the beach towards them. Carlos signaled urgently for them to push off, but Modesto ran back to get the last box lying in the sand. He gripped it firmly and had started running back towards the bonga when he was surrounded by the searchlight’s blinding white light. He heard someone shout “Halt! Halt!” But he kept running until he was thrown down by something hitting him in the back. He tried to get up, but he didn’t seem to have any strength in his arms and legs. Something under him felt warm. Blood; his blood. He had the sensation that he was swimming underwater, swimming hard, but was not moving. A dim light shone under the water. Modesto tried to swim towards it. It kept getting dimmer and finally went out.